Metallica are one of those bands whose title track songs are among the best in their catalog. There is no denying the power of a song like “Master Of Puppets” or even “And Justice For All.” I’ve said it many times and I’ll continue to say it, James Hetfield is one of the best songwriters and lyricists. Even the song “St. Anger,” though the production and tones are all terrible, there is a certain something about that particular song that just sums up that album perfectly. With all that being said, here’s Metallica’s title tracks for you to enjoy! A while back before Metallica’s new album Hardwired…To Self Destruct came out, I made an “Ultimate Set List” for them. But now that the album is out and it’s an absolute beast, I thought I should update what would be on my dream set list. One of my favorite things to do as of late is go back and look at all the set lists from the shows I’ve been to. There are certain bands I’ve seen so many times, that it’s really fun to look back on those shows and remember all that they played. So after looking at all the lists, I thought to myself what if I could write the set list for some of my favorite bands. I gave myself a few rules. 30 years ago, Metallica stepped up their game following their debut album and released Ride The Lightning. The album was recorded in Denmark by Flemming Rasmussen, who would go on to produce their next two albums. Ride the Lightning is the last Metallica album to credit former guitarist Dave Mustaine, with co-writing any songs. He is credited on the title track, “Ride the Lightning”, and instrumental track “The Call of Ktulu.” Though only eight songs are on the album, the 47 minutes of sheer intensity is very prevalent. Starting off the album is “Fight Fire With Fire.” This song opens with a very classical melody then jumps right into the thrash madness. The title track “Ride The Lightning” balances the harmony of dueling guitars with a crunchy churning riff. “For Whom The Bell Tolls” has one of the best bass parts ever. This song is beyond recognizable and is still a crowd favorite at Metallica shows. Cliff Burton really shines on this song. “Fade To Black” wasn’t well received upon first listen, but this song really showcases the ability of the band to write great songs. The entire arrangement of the song from the melody, lyrics, and riffs are spectacular, not to mention the closing solo. “Trapped Under Ice” is a very underrated thrash song. The speed of the playing on this song is intense. “Escape” is a wildcard on the album. This song has a more melodic sensibility to it. Though it does show what kind of range James was starting to develop. “Creeping Death” is my personal favorite Metallica song, it was also the first song of their I learned to play, so there is some sentimental attachment to it. The riff on this track is heavy as hell. The interesting part of this song is the lyrics as they are all about the biblical exodus and the plagues of the Jews leaving Egypt. Closing out the album is the instrumental “The Call Of The Ktulu.” This song is epic, melodic, and heavy, all the things that Ride The Lightning represents. 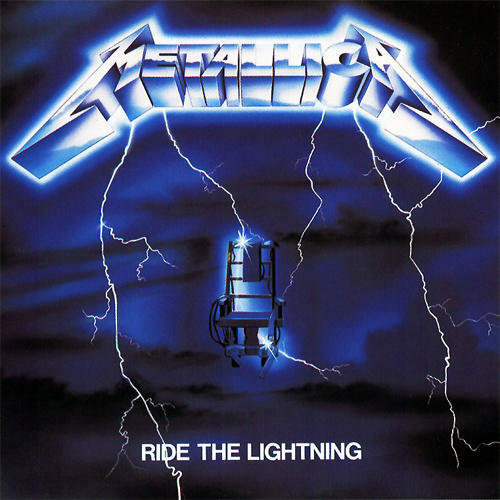 Ride The Lightning was definitely a step in the right direction for Metallica. James Hetfield and Kirk Hammett really started to come into their own as a great guitar duo. Cliff Burton was a beast on the bass. Lars actually played with a passion. For many Master Of Puppets is considered their best album, I for one am in the minority in thinking that Ride The Lightning is. Not to take anything away from Master, I just have more of a connection to this album.